On May 5, 1945 while out picnicking in the small town of Lakeview, Oregon, a minister, Reverend Archi Mitchell, his wife Elsie and five local children found a deflated balloon made from mulberry tree pulp in the woods near the town. The were about to investigate what it was when another minister ran up yelling for the others not to touch the object. He was too late and the bomb exploded. Killed in the attack were Sherman Shoemaker, 12; Jay Gifford, 12; Edward Engen, 13; Joan Patzke, 11; Richard Patzke, 13; and Mrs. Mitchell, 26. 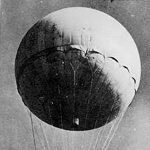 The balloon that landed near Lakeview was one of 9300 others launched into the westerly winds during the war. Others landed as far east as Ontario and Michigan, but the balloon that exploded on May 5 killing the woman and the children caused the only wartime deaths due to enemy action in any of the 48 states. 1The original idea for this piece came from Stanley Weintraub’s excellent book, The Last Great Victory. Share the post "Lakeview, Oregon Bombed by the Japanese"